Con artists, scams, racketeers, gangsters; Madoff, Ponzi, Lustig ( he tried to sell the Eiffel Tower), Gregor McGregor who created a fake country, George Parker who sold the Brooklyn Bridge and Madison Square Garden and the Statue of Liberty to boot, to pull a stunt like that you had to be good. However, compared to the greatest heist in history the aforementioned are only petty thieves. The Mother of all Heists is the ongoing con perpetrated by the Federal Reserve Bank of the United States. In collusion with the Secretary of the Treasury and President of the United States the Federal Reserve they looted the pockets of frugal Americans, retirees, those with IRA’s to the benefit of the United States government, Big Banks and large corporations. How did they do this? When the crash of 2008-2009 occurred the Federal Reserve came to the rescue, dropping interest rates at a precipitous pace to the point that they are almost negative. The effect being that those who save for the future were denied market rate interest on their savings. This injured millions of Americans to the point that to live they had to drain their savings due to no interest being paid on it. For example, a retiree expecting a nominal 6% return on $250,000 or $15,000 per year receives zero interest. This forces him/her to withdraw the $15,000 from the principal; if this keeps up for another half dozen years the principal will be down to $70,000. Basically the government stole $180,000 from this individual. The banks, the corporations and the government were the beneficiaries. Multiply this by millions. Over the course of a dozen years this HEIST numbers in the TRILLIONS. When history is written, effectively it already has, this SOCIALIST EXPERIMENT will go down as the greatest Ponzi Scheme in history, a Grand Theft like no other the world has ever seen. One reason the United States Treasury has a gold horde is to give the impression that our money is backed by something other wishful thinking. “The Full Faith and Credit of the U.S. Government” clause is nowhere to be found on new bills. 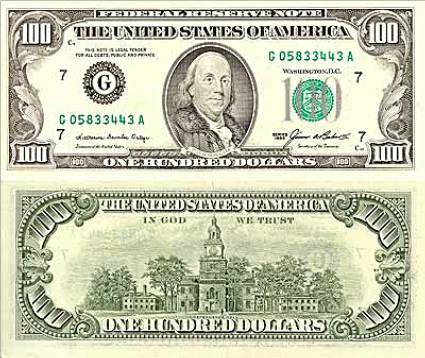 Examine the $100 bill, where does it mention that. Worthless paper with some euphemistic promise to pay in the future is all we hold. The joke is on us. Oh, we are told that Gold is worthless, then why does the government hold it? Ponder that for a while. Click here for some interesting analysis on the gold market. You may be surprised.